Unveiled at the 39th Tokyo Motor Show this morning, the Italdesign-Giugiaro Ferrari GG50 is definitely one of the stars of the show. As the GG50 name suggests, the concept car celebrates Giorgetto Giugiaro’s 50 years as a professional car designer. It also marks the first time that Giugiaro has designed and built a prototype car specifically for himself. The master designer explains, “To mark 50 years of activity in the world of car design, I decided to sculpture a Ferrari to the memory of that great adventure and enjoy it with my family”. This is the reason why the GG50 is an expression of current design trends, rather than a futuristic fantasy. The Ferrari, which is graced by his initials, GG, followed by the digit 50, is a way of epitomising Giorgetto Giugiaro’s debut into the world of automotive design in September 1955. The concept calls on the key philosophies set forward by Giugiaro, namely unmistakable form with class leading ergonomics and outstanding interior space. The GG50 is based on the Ferrari 612 Scaglietti, retaining the same basic mechanicals such as the 540bhp V12 5,748cc engine and running gear. Despite this, the Ferrari GG50 is a little shorter in length than the 612, with a fastback tail introduced to camouflage the concept’s functional hatchback boot lid. 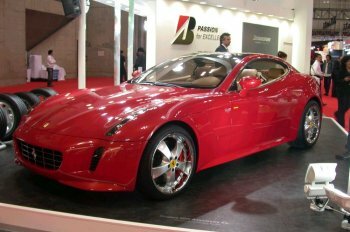 Giugiaro’s idea of creating a Ferrari to mark his 50th anniversary as a car designer, took shape during the Paris Motor Show in September 2004. It was at this event where Giorgetto Giugiaro described his dream directly with Ferrari President and CEO, Luca di Montezemolo, who told the Italian master designer to develop his vehicle concept around the 612 Scaglietti V12 2+2 coupé. Montezemolo also provided two design strategies: although no restrictions were to be applied to creativeness, the car should be inline with Ferrari’s tradition, and transmit a sensation of compactness to underline the enjoyable driving experience gained behind the wheel of a Ferrari. The project was started in February 2005, when Giugiaro started sketching the physical form of the car by hand in 1:10 scale from four orthogonal views. The side, nose, tail and plan view were all sketched out in 2H lead pencil on tracing paper using a universal chalkboard. This two-dimensional rendering is typical of Giugiaro’s method, representing a practice which he has followed for the past 50 years. Today, the method is pursued by Giorgetto’s son, Fabrizio Giugiaro, who is Italdesign Giugiaro’s Styling Area Director. The 2d rendering was then translated into mathematical surfaces on CAD/CAS software, and then projected as a 1:1 scale dynamic visualisation in the Italdesign-Giugiaro Virtual Reality Design Center. After the Virtual Reality go-ahead was given, a full-scale plaster model was milled and completed in April. Using the 1:1 scale model mock-up, studies got underway to facilitate ergonomics and the ease-of-access for the interior concepts. Construction of the running prototype was initiated at the beginning of June. Although the GG50 retains the 612 Scaglietti wheelbase of 2.95 metres, the one off is 4.81 metres in length and therefore 9 centimetres shorter than the production model. The front overhang was shortened by two centimetres, with the majority of shortening being concentrated on the rear end. With the standard 612 Scaglietti, the fuel tank is positioned vertically behind the rear seats. 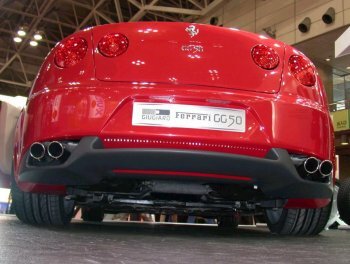 In the case of the Ferrari GG50, Italdesign engineers were faced with the task of positioning a new 95-litre fuel tank entirely below the boot line. This detail was overseen and supported by the Ferrari Technical Direction. When the rear seatbacks are folded down, the redesigned fuel tank layout provides a flat loading platform 1.40 metres deep. This increases the 240-litre loading capacity of the 612 Scaglietti to 270-litres, which can be further expanded to 500 litres with the rear seatbacks folded. It was this improved loading space, which left Giugiaro to decide on using a proper hatchback boot lid, hinged to the roof edge. In order to do so, Italdesign engineers had to redesign the rear cross-member, which in the standard Scaglietti joins the suspension strut domes atop the fuel tank. A cross-member was also added to the roof edge and was joined to two reinforced risers to take the additional weight of the hatchback door. Despite being 9 centimetres shorter in length than the 612 Scaglietti, the Ferrari GG50 concept instantly appears to be even more compact due to its subtly rounded nose and tail sections. Giugiaro explains, “In bird’s view, all cars look like a rectangle. As a consequence, the dimensions are perceived optically as being the same as the maximum length.” With the GG50, Giugiaro rounded the sections between the front and rear wheelhouses to form extreme loops at the nose and tail. “When viewed from three-quarter angles, this also enhances the look of the car optically, making the car appear leaner and bolder. In a nutshell, rather than having a fender lip that clearly defines the bodyside edge, a seamless line flows toward the centerpoint where the two extremities meet”. The fastback shape not only hides the hatchback design, but it also provides more interior space for occupants in the rear and conceals the +2 seating to give the impression of a true two-seater. The side view is characterised by the air intake which provides cool air for the front brake system. The lines flowing from the intake, stream towards the rear almost parallel with the ground line and creates a bas-relief which fades away towards the rear. The pillarless glasshouse area, framed with stainless detailing, helps to provide an elegant look, and further helps disguise the 2+2 seating layout. As with Ferrari’s most stunning cars, such as the 250 GTO, the belt line arches in correspondence to the rear wheel, highlighting the extreme power fed through the rear axle. As Ferrari tradition calls, the LED dual tail lamps are round, although are in this case asymmetrical with the inner lights being of a smaller diameter. Adding to this, Italiaspeed are keen to point out that the rear design gives a strong indication to next year’s Alfa 147 replacement, which is scheduled for the Paris Motor Show. We therefore cannot ignore but question as to whether Giugiaro’s “free hand” was more compromised and politically guided than he publicly made out. The front displays a simple and delicate view, with the low-slung Ferrari grille being as unmistakable and passionate as ever. A hint of Formula One and Enzo is shown in the middle of the bonnet, where a V shape flares forward in the centre. Alongside the traditional Ferrari grille are two complimentary vertical air intakes, above which the fog lights are housed behind glass sections. Simplistic, vertical headlights continue Ferrari’s current theme first presented on the Pininfarina Rossa concept. The units house Xenon headlight beams and dimmers, along with the indicators. The bulk of the bobtailed rear end has been reduced with a black-painted undersection which houses the quad-pipe stainless exhaust system. The chrome Prancing Horse logo, set against the blood red metallic paintwork, is set at the forefront of the design. A small integrated spoiler at the crest of the lower hatchback section, provides extra downforce to ensure greater stability at high speeds. The hatchback design is perfectly concealed, and is further complimented by the photochromatic glass roof. Whereas the GG50’s exterior design was the result of an emotional pencil sketch, the interior was fashioned as the full-scale mock-up progressed. The interior largely retains the appearance of the Scaglietti, but the claustrophobic sensation in the rear was eliminated by sloping the rear window at the side. “Getting in and out of a 2+2 coupé is never an easy feat, because access is directly proportional to the door’s length, which cannot be stretched to the infinite. Indeed, the GG50 door’s structural frame mesmerises the Scaglietti’s door framework. However, enhanced headroom has been gained by sloping the rear window, thereby making it much easier to get in and out of the car than expected. Just try getting in and out of the car and you’ll see how easy all this can be”, explains Giugiaro. More concentration was applied to the driver’s right hand, traditionally used to change gear. On the 612 Scaglietti, the F1 gear change is fitted behind the steering wheel, and leaves more options open for the right hand. As a result, many commands and controls traditionally found on the left-hand side of a Ferrari LHD steering wheel, such as lights and electronic handbrake, are now relocated in the centre of the cockpit. The instrument binnacle is the same as on the Pininfarina designed production car, but the dashboard is entirely new. Centre of attention is given to the AVIC-X1R satellite navigation system by Pioneer. Two generous storage pockets are located between the front and rear seats, both protected by a flap. The door panels, which also feature large storage pockets, are finished with a horizontal natural beech insert. The re-trimmed beige leather seats use the structural frames found in the production car. Underbonnet design has also been tackled, featuring a mix of silver, dark gray and gauze covered sections. The legendary red craquelure cylinder heads of the 5.7 V12 engine remain visible.